Hoosic River Watershed Assoc. invites everyone to RIVERFEST at the Spruces Town Park, Main St., W’town on Saturday, May 11, 11am-4pm. A $5 raffle tix (available at MountainOne bank in Wtown) admits 1 adult. Riverfest admission is $8, includes a raffle tix! 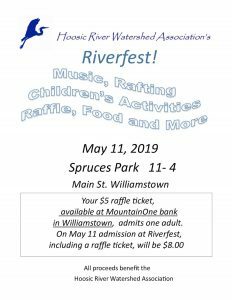 All proceeds benefit the Hoosic River Watershed Association.